I really want to get going on some experimenting with other mediums. The problem with work is it doesn’t leave enough room for play. And without play, I find my artwork getting tighter and tighter. I need to get sloppy with some great big sheets of paper and whatever medium happens to be around. Unfortunately, my studio is a little too cramped at the moment to start throwing paint around, so I thought I’d try something a little smaller for now. I’ve always wanted to try etching but have been uninterested in having to deal with the acids involved in the process. I love the subtle blurred line of the medium and the fact that it’s drawing, which I really enjoy. 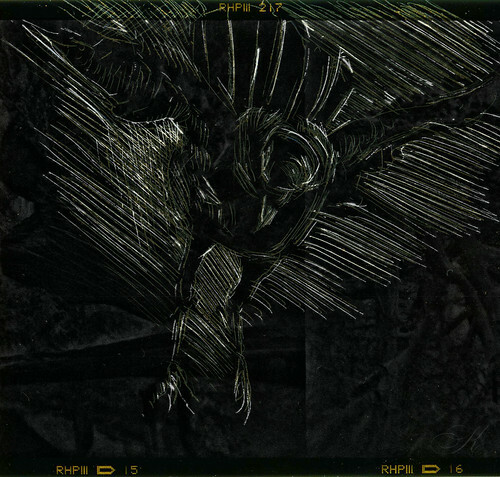 The alternative is dry point, but not having any metal plates or a press lying around, I thought I’d put some of my ruined 120 negatives and slides to good use and scratch on them – scratchboard style. Here’s a quick experiment to see how it would work. I scanned the drawn-on slide with an underexposed frame on top. The drawn layer was then scanned directly on the flatbed and other I combined the two files together, a little off-register. One the subject of drypoint, I saw a lovely book in Duthie Books the other day: The Raven, illustrated by Ryan Price. I think I’ll have to go back there and buy it. It’s a really beautifully designed and illustrated book, published by Kids Can Press.